The Crosbyton Clinic Hospital Emergency Department is open 24 hours a day, 7 days a week to meet the needs of the public. Our Emergency Department is staffed by nurses who have training in emergency medicine and are supported by other healthcare professionals such as Laboratory and Radiology Technicians and Paramedics. Crosbyton Clinic Hospital takes pride in the ability to offer physician services by Board Certified Physicians who are on active staff with Crosbyton Clinic Hospital or associated with Covenant Medical Center in Lubbock, TX. Crosbyton Clinic Hospital Laboratroy Service is part of the team of medical professionals that provide testing to assist the physician in helping you. Our laboratory utilizes current technology for medical laboratory testing procedures. Our laboratory is C.L.I.A. Certified, which means we perform quality pocedures according to current acceptable standards. Our laboratory professionals are committed to provide reliable results as efficiatly as possible. Our mission is to provide personalized, courteous and professional services as we interact with our clients daily. The Nursing staff at Crosbyton Clinic Hospital is dedicated to serving the community with respect and dignity. The nurses are caring and compassionate to patient and family needs. The nurses take the Crosbyton Clinic Hospital Mission statement seriously - each person's life is of great value and deserves respect in all stages from conception until death. Supervised nursing care is provided for the Emergency Room and general inpatient care. The nurses constantly strive to improve their skills and stay abreast of the newest technology and procedures. 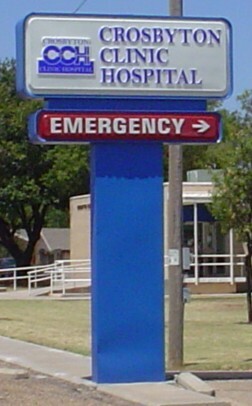 The hospital provides free continuing education classes through Texas Tech Health Sciences Center. The Nusing goal is to receive 100% satisfaction reports from the patients and family members. Our Physical Therapist has a strong background in orthopedics, and is certified in wound care. Other services offered by our Rehabilitation Department include treatment of the following: sports injuries, joint replacement, industrial injuries, neuro-rehab and other musculoskeletal conditions. Crosbyton Clinic Hospital has a strong emphasis in meeting the needs of the individual patient. We believe in our unique abilities to provide cost-effective inpatient and out-patient care. Crosbyton Clinic Hospital Radiology Department provides routine x-ray exams, EKG's and ultrasound. Mobile services include MRI scans through Diagnostic Management Group of Abilene. In June 2006, the radiology department implemented computerized radiography for filmless x-rays. Storage systems were also upgraded to provide faster viewing of x-ray studies with the hospital and the ability to transfer those images as patient needs dictate. The filmless x-rays decrease waiting periods allowing our Reading Radiologist and local Medical Staff access to the studies in seconds. We are very excited about our new CR system (filmless x-ray) and proud of the use of the technology and hard work of our Radiology Department. Our Director of Radiology is very excited and agrees we are very fortunate to have the Computerized Radiography, which allows patients to take a cd with there x-rays to other doctors instead of the acutal films. Crosbyton Clinic Hospital offers a Swing Bed Program. This is a program to allow skilled nursing care and continuation of hospital treatments and services after a patient is stabilized from an acute period of illness. Swing bed programs are certified by Medicare.